Ah, how lovely to open a book in the MALBA bookshop yesterday and see these two dear ladies. 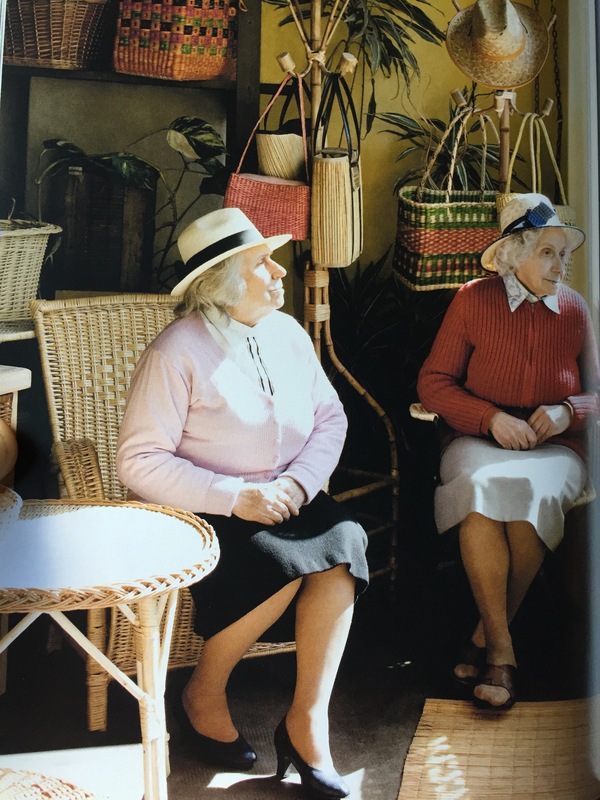 Mari and Lita Marcovecchio are sisters, now in their late eighties, run a wicker and rattan shop in Palmero that has been on the same site since 1954. The sisters are descendants of an Italian family who immigrated to the country in the early twentieth century, full of dreams and ideas. 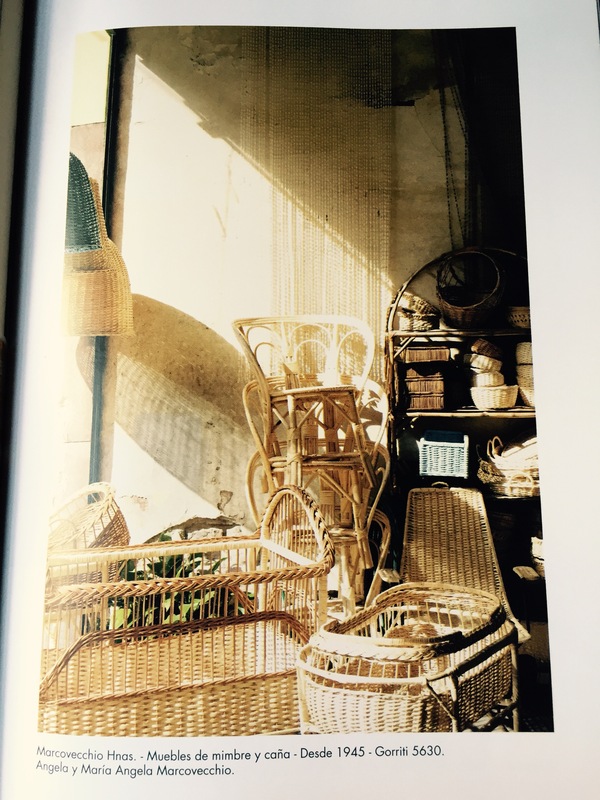 Liborio, their father started selling wicker baskets and chairs in a horse drawn wagon he settled in Palermo opened the shop on Gorriti 5630. I’ve known them for ten years and although they have aged, Mari is as ever the determined businesswoman, on top of every detail and centavo. Lita’s wide and sweet smile must have contributed to sales figures over the years, winning over architects, buyers, producers. The book is a collection of portraits, like the ones below, of old shops in Buenos Aires that have the air of being suspended in time. Any visitors to the Argentine capital who makes a few small steps off the tourist trail or trendy blocks will find ‘locales’ like this. They are insights into an older way of life, into generations past. They are testament to the ‘quiet resistance’ (as Sanricca puts it) of these businesses that refuse to give in to modernisation, real estate offers, and the trends of those surrounding them. In Hay too, the booksellers in a tiny Welsh market town, are staging their own quiet resistance. At least 15% of the UK’s independent bookshop are in Hay-on-Wye, set in a rural location with just 1500 residents. The booksellers, many of whom have been in business for a couple of decades or more, believe in giving books a presence on the high street, in understanding how books are made, their provenance, the marks and details that set an individual copy apart from another. They believe in talking with customers, feeling cheered by a bibliophile who discovers on a much-wanted book, a tourist who finds rest for weary legs, sitting in an armchair browsing the pages of a book, or to a young person about their interest and being able to introduce them to rows of shelves dedicated to that niche subject. Perhaps the reason why I feel at home in two very different places – Hay-on-Wye and Buenos Aires – lies in the abundance in both places of independent shops, often family businesses with different generations working side by side. The Argentine capital and the Welsh border town both have more bookshops per capita than most places in the world. The owners of ‘locales’ (shops) in both places share a strong individual spirit, prepared to choose another way and swim against the tide. Booksellers in Hay – Mari and Lita and others in this book are kindred spirits – and long may you all keep up the quiet resistance. sounds as if Buenos Aires has changed (a lot) for the better since my late Mama (may she rise to a bright Eden) was there in the (late) 4os (before heading for Rio). the women in the photograph, incidentally, could well be her (centre stage, proudly formidable) and her (sweeter-natured) elder sister; the resemblance to these two (at that age) is uncanny (almost spooky) though my maternal family is Basque not Italian. I like the two paragraphs about Hay as well, the booksellers there, and would that it were so. It used to be, some years ago, and still is (to a degree) but I fear the exigencies of trade (a literally ‘treacherous’ endeavour) and the post-Thatcher urge to make a killing (instead of a living) have undermined (and overwhelmed) the more humanistic motives, values and so forth. Of course, I could be wrong (but I don’t think I am, alas).